Having spent the earlier part of the day enjoying a few snapper throats at the Bright Star and a little time at a bookstore, it was soon time for my next stop at a Birmingham institution, Frank Stitt’s original restaurant, the Highlands Bar and Grill. Opened in 1982, Highlands Bar and Grill is Stitt’s combination of southern flavors and ingredients with his background in French cuisine. But for me, Highlands is more than a stalwart of the Birmingham restaurant scene, it’s been a goal that has been taunting me for years. Much like Hot and Hot FishClub, another renowned Birmingham restaurant, Highlands has been just out of my reach, largely due to its hours of operation. Try as I might, dinner in Birmingham is a rare proposition. Now, with this opportunity at hand, I planned to take full advantage of my first meal at Highlands Bar and Grill. Friday night in late January and Highlands was bustling with activity as every table was filled to capacity. Despite having made reservations earlier in the week, I had time to enjoy a cocktail at the bar before my table was ready. Once seated, I was stuck with the typical dilemma of far too many attractive choices and general indecisiveness. Jokingly complaining to my waitress that they were in dire need of a tasting menu, she quickly scampered off to the kitchen. Returning just moments later, she was happy to inform me that a tasting menu could be made from any five dishes of my choosing. However, before any of my choices had a chance to arrive at the table, it was time for a little taste of cornbread. 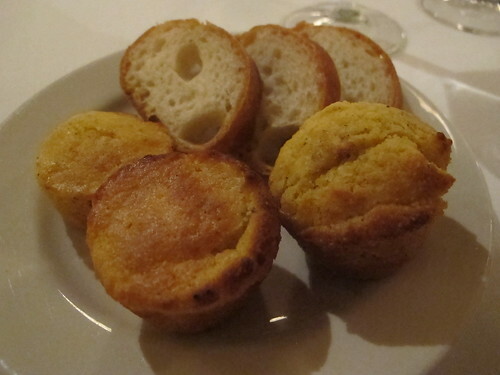 Appearing in the bottom left of the picture, this small piece of cornbread struck an ideal balance between salty and savory. Of course, it never hurts when cornbread is made sublime by the addition of a little butter. 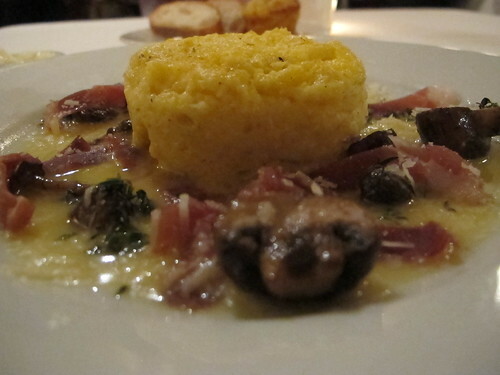 Diving headfirst into the southern heart of the menu, things started with the stone ground baked grits. Exceedingly creamy, this grit cake seemed to defy gravity. 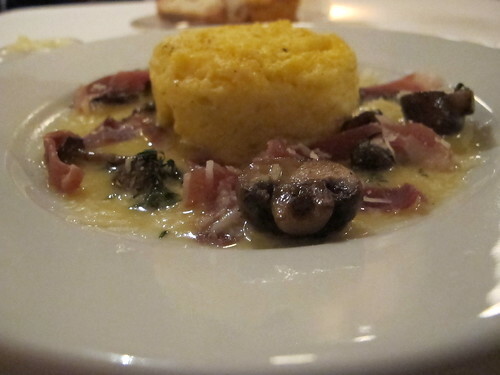 If this dish confirms anything, it’s that country ham and grits are a salty match made in heaven. Rounding out the dish were mushrooms and parmesan which while well paired on their own, I wasn’t quite sure what the mushrooms brought to the dish. However the only thing this dish truly needed was a good shot of black pepper, once applied this was a truly precocious start to the meal. 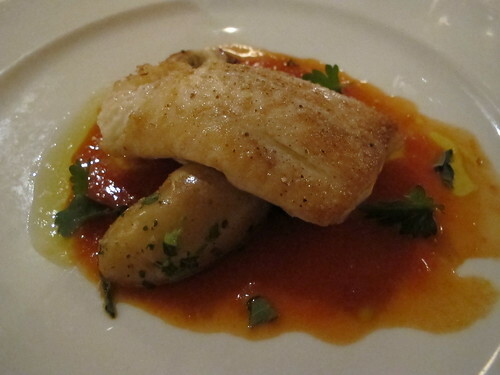 Apalachicola gigged flounder was the next dish in the tasting menu and it came with a Provençal sauce with roasted fennel, Niçoise olive, fingerling potatoes, and marjoram. 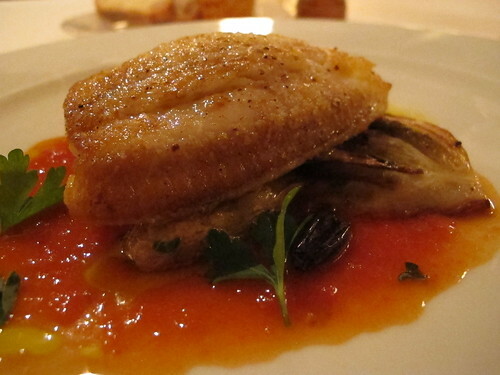 Crispy on the edges, moist in the middle, the flounder paired well with the bright and well rounded sauce. 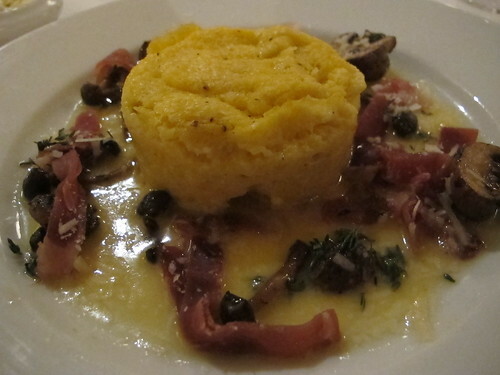 The Provençal sauce was deceptively simple with a clean tomato flavor that finished with a bite of olive tartness. Third in my tasting menu was the rabbit - two ways. First of the duo was a Tuscan kale stuffed loin and while the kale added a slightly bitter and green dimension to the loin, I was surprised at the grainy texture. In stark contrast, the braised leg was achingly tender and sublime with the sherry reduction. At this point, I noticed that Highlands preferred their vegetables to have a toothsome texture. I won’t say they were undercooked but I like my potatoes to not crunch when I bite them. 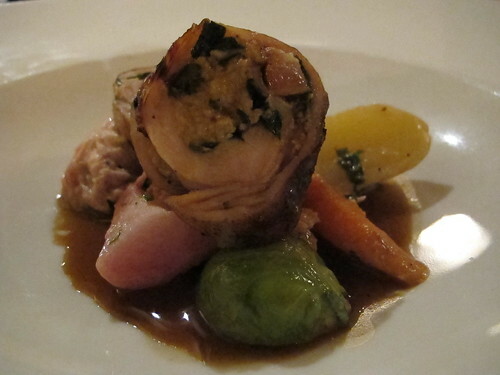 Proving the allure of pork wrapped in caul fat, the pork crépinette and grilled rabbit liver was the fourth dish on my menu. 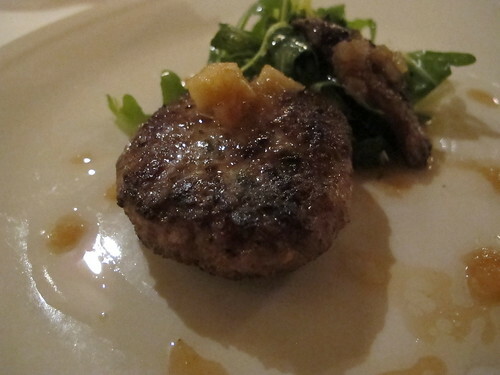 With plenty of give from the caul fat, the highlight of the crépinette was the combination of the pork and vinegar flavors of the honey crisp apples and frisee salad. 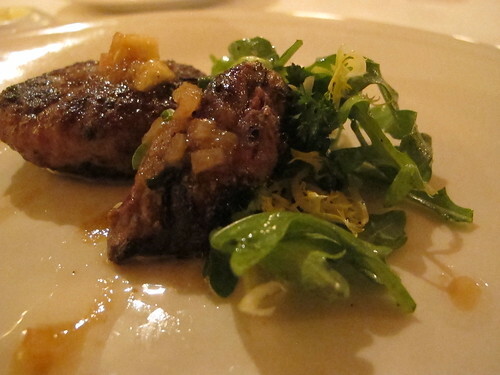 In contrast, the grilled liver began with a crunch of finishing salt and fruit but quickly soured with the addition of overdone liver. Letting my waitress know about the state of the liver, I was expecting an apology at the most but I wasn’t prepared for a new piece of liver to be brought from the kitchen. 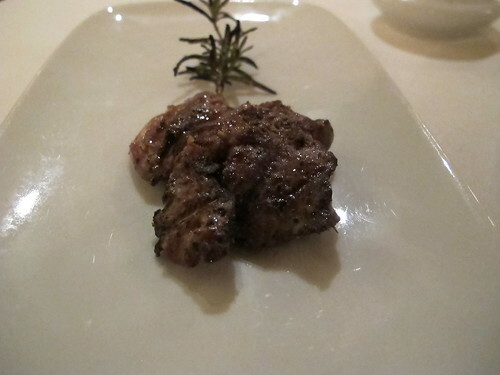 Skewered with a sprig of rosemary, this liver still had the big salty introduction but in lieu of the apples, the woody flavor of rosemary and citrus highlights of fresh peppercorns took its place. 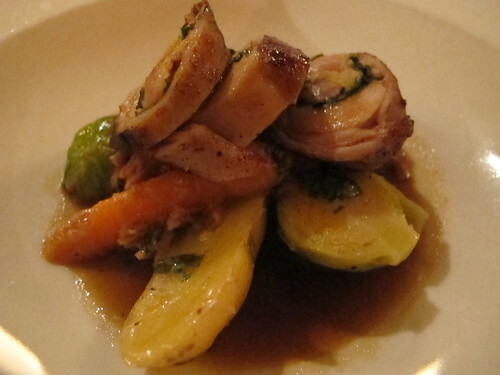 For the last course, I decided to switch gears and try a little fowl with the stuffed South Carolina quail. Sticking to bold flavors, this quail was mated with a cornbread and foie gras stuffing, green lentils, and a sorghum gastrique. 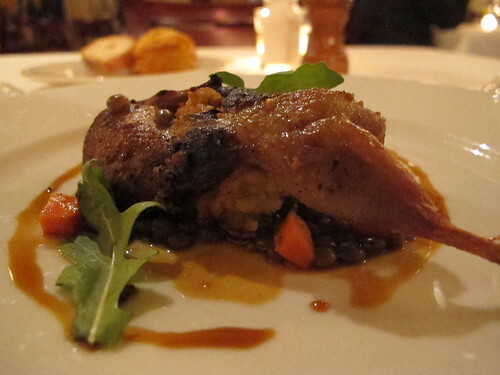 With the lentils baring a stronger resemblance to a piece of chalk than any edible legume, I was relying on the cornbread and foie stuffing to support the quail. Unfortunately, the stuffing completely dominated the bird with a mealy sweetness and none of the rich foie gras flavor I was expecting. 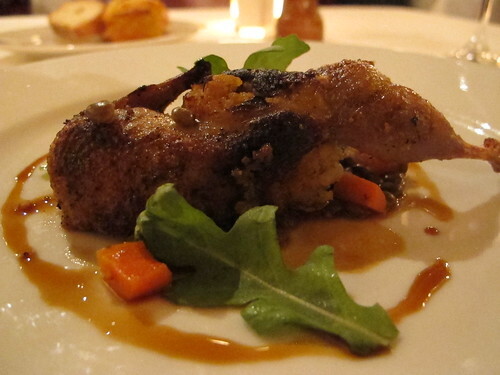 This quail was far and away the weakest part of the meal. At this point, I expected the meal to be finished and an after dinner drink would be that all that stood between me and my drive back to the hotel, but that was not the case. 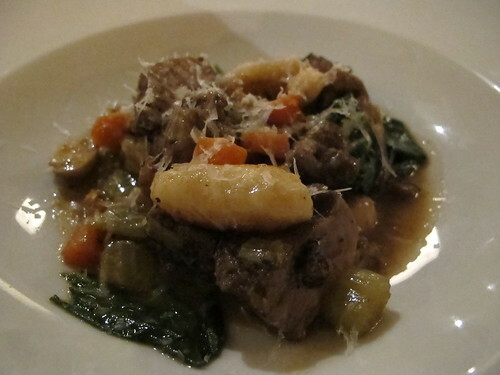 Chalk it up to either voicing my complaints or having a productive dialogue with my server, a complimentary order of the braised pork cheeks and potato dumplings was brought to my table. 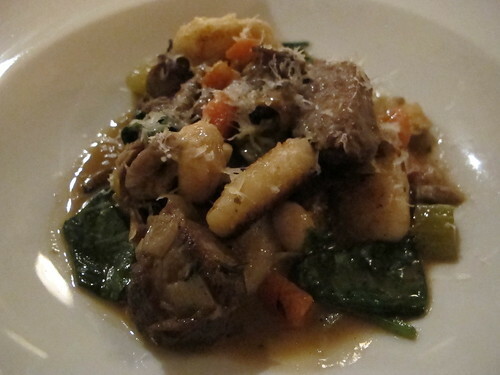 Like many of the vegetables in this meal, including the hedgehog and yellow foot mushrooms in this dish, the pork wasn’t fall apart tender but the dense flavor of the cheeks was ample reward. 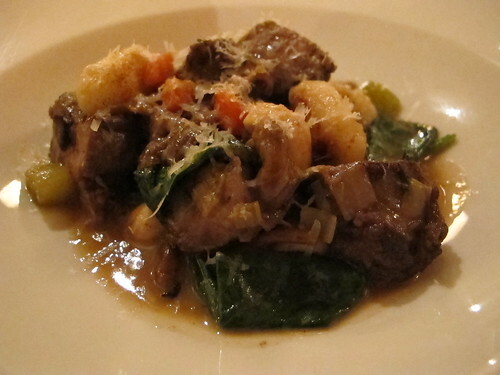 When this dish was first brought, I was expecting the potato dumplings to create a starchy mess but each flavor in this dish was distinguishable and played off the others quite well. One particularly nice touch was how each potato dumpling was pan seared, the contrast of dense dumpling with crisp seared exterior was delightful. If I took away anything from this long awaited meal at Highland Bar and Grill, it’s that while the flavors and the subsequent combinations are supremely important, the addition of excellent service can make a good meal a great one. Even taking the liver and quail into account, the dishes at Highlands were prime examples of Stitt and his kitchens taking full advantage of the bounty of the South. I can see why Highlands Bar and Grill has been open for more than 30 years.